You will receive our new 2019-2020 Eden Seeds & Select Organic 96 page colour catalogue, plus three packets of heritage seeds (of our choice) in Spring 2019. 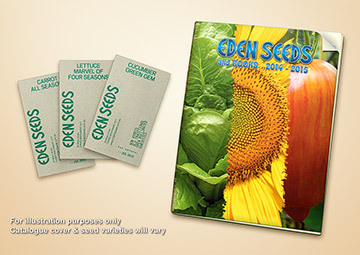 A great way to help support us & maintain the largest range of vegetable/herb seeds in Australia, & other rare varieties. Please note that all subscriptions are sent out once a year, in Spring. If you are ordering other products today then the subscription will not be sent with today's order.